One of my earliest food memories as a little (well even smaller) girl was being taken to a restaurant in Italy with the family and being presented with a plate of homemade tagliatelle with lashings of olive oil and topped with a generous shavings of fresh truffle. I remember initially not being very sure about the alien-like brain section pattern and the unusual fragrance, but with one taste and a table full of encouragement and arm waving from those already in the know, I realised that truffles were going to be one of my favourite foods. But at 6 years old, you can't quite appreciate how expensive these beautiful "black diamonds" are. Lord only knows what my parents paid for that plate of pasta for me! But I do dip my toe in the pool of extravagace and indulge in a truffle every now and then, life really is too short. 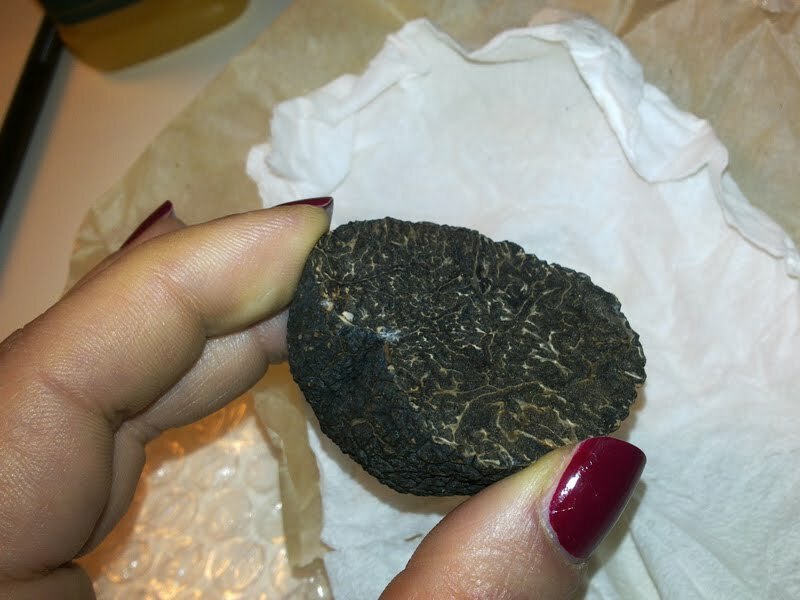 So I knew that I was a very lucky girl indeed to win a fresh Black Winter Truffle in a competition. I got 20g (about £60) from Mister Truffle, a new venture selling fresh truffles by the gram which I think is a genius idea for affordable luxury as you don't have to buy the whole truffle, only ordering what you need. This black winter truffle was so wonderfully pungent, that on opening the delivery, it filled the air with its gorgeous aroma. 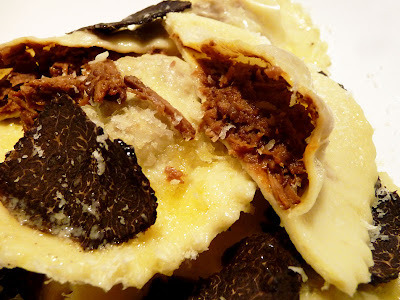 Dealing with truffles in recipes can be quite tricky. 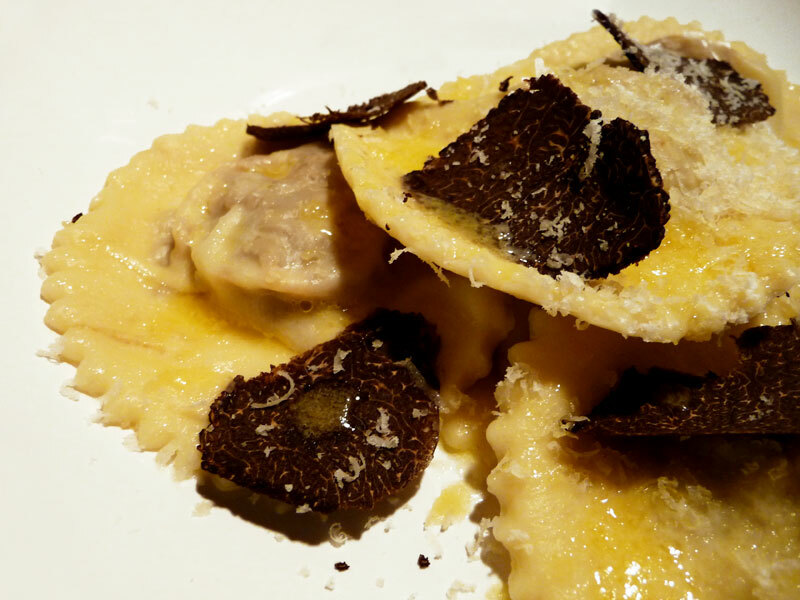 I think as the truffle is such a wonderful flavour it should shine through, so pair back on the other ingredients. Pasta for instance, is a perfect vehicle to show off the flavour which is why it is often served with it. Saying that, it does work well with robust red meats; beef, venison, pheasant, rabbit, duck and even veal (but never lamb). My first choice for the ravioli filling would have been pigs cheeks and would have used this base recipe to prepare them, using wine instead of cider but couldn't get cheeks for love nor money this week. Instead I settled for a similar texture and bought a piece of brisket, cooking it slowly in stock then wine for a punchy partner to the truffle which worked a treat. This makes about 20 large ravioli but depends on the size and shape. Serves 2 people gluttonously (Mr Graphic Foodie, the truffle pig, happily ate 14 of them which was OUTRAGEOUS), 4 people sensibly and 6 people as a starter. In a small, heavy bottomed saucepan, fry the onion and carrot gently in the olive oil until soft. Add the beef brisket and brown thoroughly. Add the stock, tomato concentrate, thyme and garlic cloves. Cover and simmer for 1.5 hours, stirring occasionally. Add more stock if the pan becomes dry. The stock would have reduced by now so add the red wine and gently simmer for a further hour until reduced and thick. Turn out onto a plate and allow to cool thoroughly. Once cooled, take half the mixture and blend until smooth. Break the remaining meat down a little with the back of a spoon. Add the blended mixture back to the meat and combine thoroughly. I used a round ravioli cutter for this (bought at Carluccios) but you can use whatever shape you want or cut them by hand into square ravioli, sealing the edges with a fork. Place a walnut sized amounts of the meat mixture along the pasta strips at suitable intervals for your cutter, brush the sides and in between with a little water using a pastry brush. Lay a second strip on top, starting at one end, guide the pasta around the mixture using the side of your hand expelling any air as you go. The pasta top should hug the mixture tightly. Cut the ravioli and rest on a lightly floured surface whilst you do the rest. Use the offcuts and put through the machine again for more strips. If you work quickly, it shouldn't dry out. I think it is now best to let these rest for 15 minutes to dry out a little, but you can cook straight away. Cook the pasta in plenty of salted boiling water with a slug of olive oil until they rise to the surface. Cook until al dente, testing the thickest part. To make the sauce. Melt a generous amount of butter for the sauce in a small saucepan. Drain and place on warmed plates, spooning over the butter sauce, shavings of the fresh truffle and Parmesan or Pecorino.